Only 112 years after its last appearance on a legislative floor—the doomed bill in the Indiana statehouse that offered nine different values for the number—Pi made a surprise appearance in the U.S. House of Representatives in 2009. March 14 fell on a Saturday in 2009, but that didn‘t stop things from heating up in the week leading up to it. 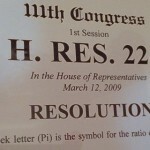 On Monday, March 8th, Representative Bart Gordon of Tennessee introduced House Resolution 224, officially called “Supporting the designation of Pi Day, and for other purposes.” As the chairman of the House Committee on Science and Technology, Gordon’s intent was clear: to use the holiday as a platform for making a statement about the importance of math and science education in America. The resolution was co-sponsored by 15 other House members from across the country, including the exuberant Brian Baird (Washington). “I’m kind of geeked up about it,” Baird told a reporter. “It’s crazy, but I’m a whole lot more excited about that than congratulating the winner of last year’s Rose Bowl.” In order to pass, the resolution needed “Aye” votes from two-thirds of the chamber. The vote was conducted by voice, and everyone was for it. Well, almost everyone. A handful of “Nays” were heard across the room, so Davis called for a roll-call vote to put everyone’s stance on the record. The matter was tabled, and everyone had the night to mull it over. The next afternoon, on March 12, the votes were tallied and the verdict was in: 391 to 10. So, you ask, there were ten elected officials who didn’t like the idea of making math and science fun? Who were these people? 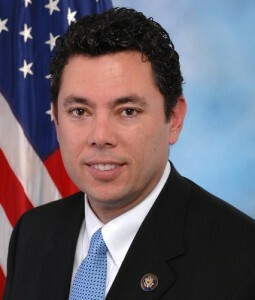 And if Chaffetz’s wavering wasn’t enough, there was one other Congressman who added to the unexpected (hint of) drama. Mike Pence, now the nation’s Vice President, was part of the overwhelming majority supporting Pi Day—that is, until the very last moment. The record shows that after 15 minutes of open voting, viewable on C-SPAN at the time, Pence changed his vote to become the 10th “Nay.” What makes this act the perfect ending to the latest chapter in Pi’s colorful history? 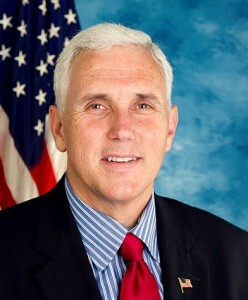 Mike Pence was a representative of the great state… of Indiana.